Lock in a great price for The Portree Hotel - rated 8.5 by recent guests. Great service and the free breakfast was tasty with lots of options (although I only tried the full Scottish breakfast). 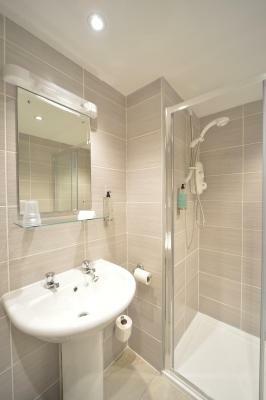 The shower facilities were quite easy to use despite the mini-sized bathroom overall. Outstanding breakfast, location and quality of service. Excellent place to stay or visit in Portree. Breakfast was good. Room was stylish although we were on the top floor with no lift. Our cases were brought to us. Breakfast was wonderful, dinner at the restaurant was also delicious! Great location! Lovely welcome at reception and staff in restaurant in the evening and breakfast as well. Definitely recommend the waffles! It’s conveniently located at the city centre of Portree nd the breakfast is good. 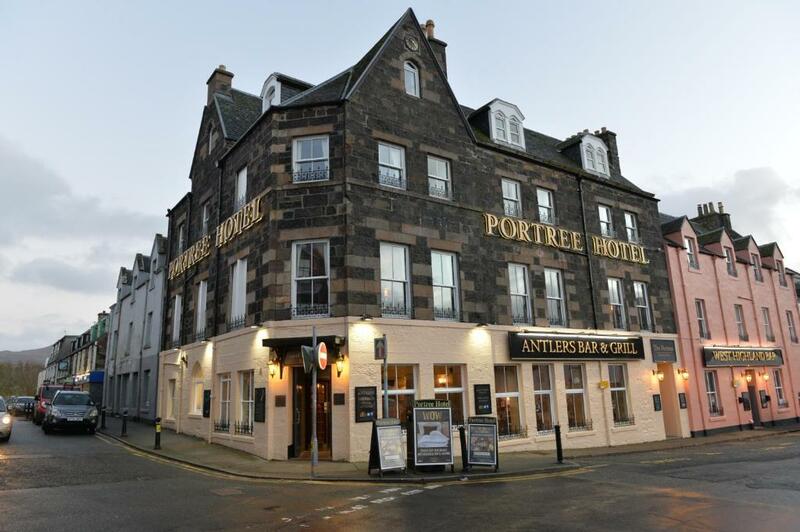 Originally built in 1875, The Portree Hotel is situated on the corner of Portree's main street and overlooks Somerled Square, the town’s main square. The main bus stop and taxi ranks are on the doorstep, offering direct links to other parts of the island. 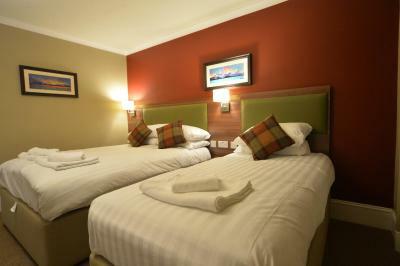 The hotel offers 24 en-suite rooms all with a 32-inch flat screen TVs, tea/coffee making facilities, hairdryers and irons. There is limited WiFi in the downstairs public areas. 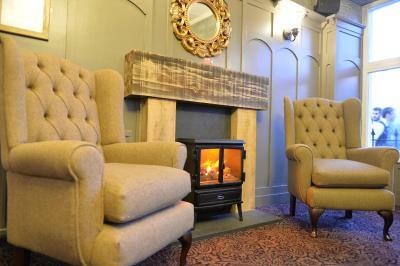 Guests can drink and dine on site in the Antlers Bar and Grill and West Highland Bar. Wood burning stoves will be fired up in colder months and live music is provided at weekends through the winter months and every night during the summer season. The Portree Hotel has been welcoming Booking.com guests since 13 Nov 2015. 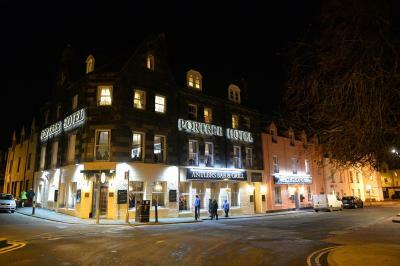 When would you like to stay at The Portree Hotel? 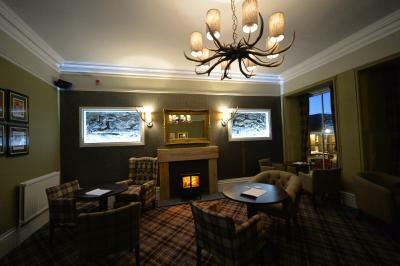 The Portree Hotel is in one of the best locations in Portree. It's in the heart of the village on the town square which means it is close to various restaurants, pubs and shops. House rules The Portree Hotel takes special requests - add in the next step! Cash The Portree Hotel accepts these cards and reserves the right to temporarily hold an amount prior to arrival. The Portree Hotel accepts these cards and reserves the right to temporarily hold an amount prior to arrival. 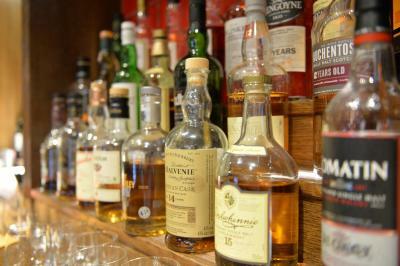 Please be aware that some rooms are above the bar; please request a quieter room if required. We had to carry our bags up four floors as there was no elevator. They do tell you that though, so there were no surprises. Just pack light! The location was ideal. The hotel had a great restaurant and rooms were comfortable. The floor was a bit creaky and it would be better if more channels are available on TV. Friendly honest staff and clean. WiFi did not work on top floor. Heated Towel rail not working. 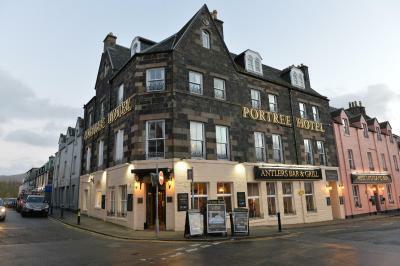 My wife and I booked a double room to stay at the Portree Hotel. The room was so small we could not pass each other past the bed despite us both being thin. We were told it was a double room. It clearly was not. The bed had only one light above it fixed onto the head board clearly suggesting was for one person. It only had one bedside cabinet/ table again suggesting it was for one person as if it was for double occupancy it would be reasonable to of expected a lamp and a table on both sides of the bed for both people to use. The room was so small it was uncomfortable. What a let down no wonder they took £500 upfront before we stayed for the five nights. We were seriously disappointed!!! Bed was a little difficult to sleep in. Would recommend getting the larger double room if two people are sharing.